For the past 4 weeks, France has been gripped by massive nationwide protests collectively dubbed the ‘gilets jaunes‘ or yellow vests. Hundreds of thousands of citizens have taken to the streets in major French cities, culminating in violent clashes between the police and protesters, the likes of which France has not witnessed in 5 decades. Faced with people’s wrath for weeks, Macron’s government has put new fuel taxes on hold to mitigate the protests and violence sweeping France. However, protesters say the real problem lies in the government that has lost touch with its people. The protests have no identifiable leadership and gained momentum via social media, encompassing a range of participants from the anarchist far left to the nationalist far right, and plenty of moderates in between. In recent days, the police and ambulance workers have joined in the protests in solidarity. The yellow vests movement was sparked by the rise in duties on diesel, which is widely used by French motorists and has long been less heavily taxed than other types of fuel. Protesters charge that this diesel tax disproportionately affects the rural and working-class population who can’t afford to live in the cities and rely on cars to commute. The cost of diesel has surged 16% this year from an average €1.24 per liter to €1.48, even hitting €1.53 in October, according to UFIP, France’s oil industry federation. The movement has grown to reflect a range of grievances, including the marginalization of rural areas, high living costs, and general anger at President Macron’s economic policies. 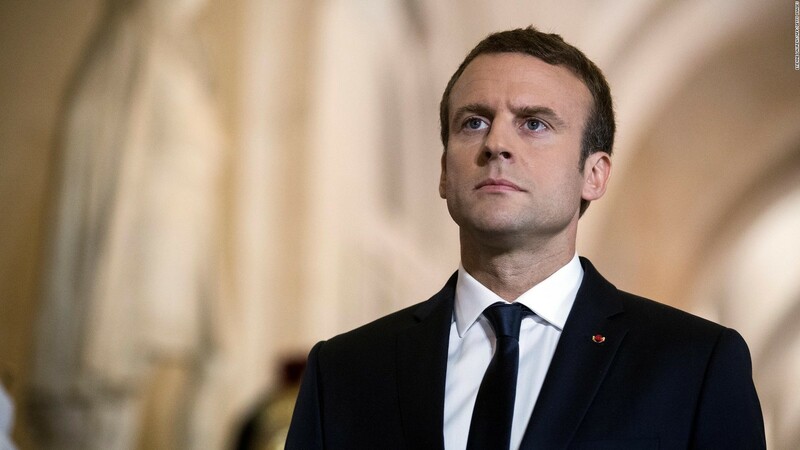 Mr. Macron was elected on a platform of economic reform which would improve the lives of French citizens through lower unemployment and a kick-started economy. But many feel that has not come to pass. 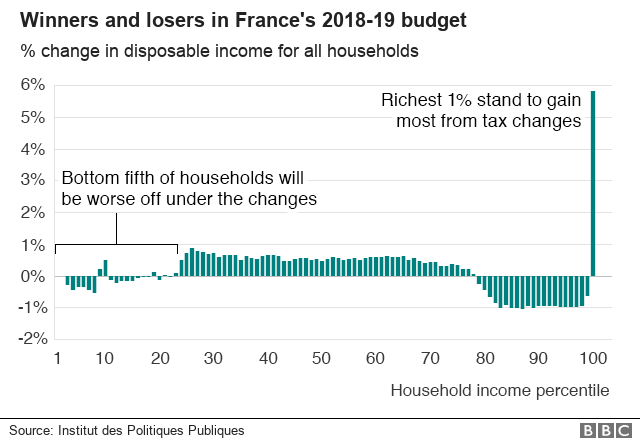 An analysis of the 2018-19 budget carried out by France’s public policy institute found that incomes for the poorest quarter of households would largely drop or stay the same under the plans. Middle-income earners would see a modest bump – but the greatest beneficiaries would be those who were already wealthy, in the top 1%. The pattern is worse for retired people – almost all of whom will be worse off. France, like other Western countries, has seen a deep gap grow between its richest and poorest citizens. The top 20 percent of the population earns nearly five times as much as the bottom 20 percent. France’s richest 1% constitute over 20% of the total wealth generated by the economy. Yet the median monthly income is about €1,700 euros, or SGD2,650, meaning that half of French workers are paid less than that. Many of the Yellow Vest demonstrators are protesting how difficult it is to pay rent, feed their families and simply scrape by as living costs keep rising while household incomes barely budge. “What he [Macron] does not want is to tax [big companies] … [the French oil giant] Total that does not pay taxes in France … There are rich people, who are getting richer and richer and pay fewer taxes. In the end, the Yellow Vests, who can barely provide for themselves, see that something has to be done,” an elderly woman said. The French government has swung right on immigration policy in recent months to account for growing public discontent over the ongoing European migration crisis. 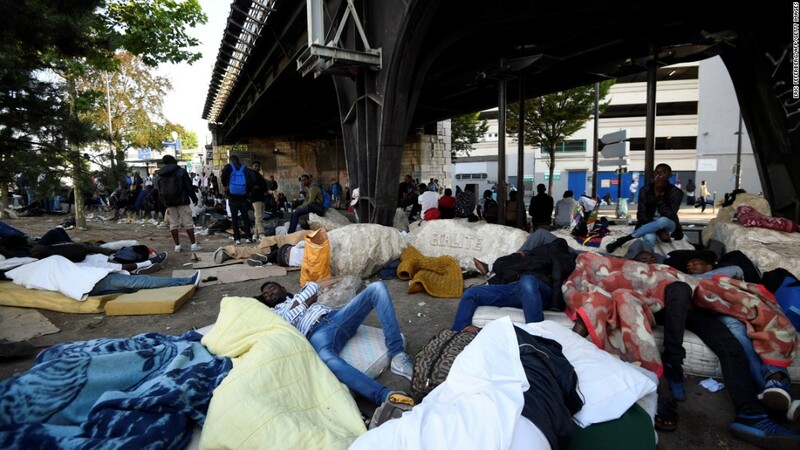 Over 50% of French citizens believe their country accepts “too many immigrants” according to a comprehensive poll data published on 1 Dec by the French weekly Journal du Dimanche has shown. According to the poll, conducted by Ifop 52% of French men and women believe that France welcomes “too many foreigners”. Another 27% believe France welcomes “enough”. Taken together, some 79% of the country’s citizens believe France does not need any more immigrants. Amid the growing yellow vest protests across France, French President Emmanuel Macron and PM Edouard Philippe’s approval ratings have sunk to new lows according to an Ifop-Fiducial poll Published in Dec.
Macron’s approval rating fell to 23% in the poll conducted late last week, down six points on the previous month. Philippe’s rating fell 10 points to 26%. Macron’s score is matched only by his predecessor Francois Hollande in late 2013. Hollande was then considered to be the least popular leader in modern French history.